Watch the movie again and pay attention to the southern hemisphere. Another filament erupted there in apparent sympathy with events in the north. Coincidence? Probably not. Invisible threads of magnetism connect widely separated parts of the sun, so an explosion in one place can trigger another explosion very far away. SDO has observed many such chain reactions--the iconic example being the global eruption of August 2010. In scenes reminiscent of the Hollywood blockbuster The day After Tomorrow, the Northern Hemisphere was frozen by a sudden slowdown of the Gulf Stream, which allowed ice to spread hundreds of miles southwards from the Arctic. Is CO2 the main driver behind climate? Warmist scientists would have us believe it is. One recent European study claims that CO2 and temperature rose simultaneously at the end of the last ice age, implying CO2 is a real driver. However, one prominent German meteorologist dismissed it and bluntly called the Laboratoire de Glaciologie et Géophysique de l’Environnement study by Parrenin et al ”the latest gag“. Now yet another new study published at Quaternary Science Reviews shows in no uncertain terms that the sun, the source of almost all of the Earth’s thermal energy, drives the climate and that the climate naturally swings in cycles. The paper looks at the relationship between climatic variations, vegetation dynamics and early human activity between c. 4150–2860 BC reconstructed from a high-resolution pollen and geochemical record obtained from a small lake located in County Sligo, Ireland. An artist's concept of the Wind spacecraft sampling the solar wind. Justin Kasper's science result is inset. March 8, 2013: Using data from an aging NASA spacecraft, researchers have found signs of an energy source in the solar wind that has caught the attention of fusion researchers. NASA will be able to test the theory later this decade when it sends a new probe into the sun for a closer look. The solar wind is a hot and fast flow of magnetized gas that streams away from the sun's upper atmosphere. It is made of hydrogen and helium ions with a sprinkling of heavier elements. Researchers liken it to the steam from a pot of water boiling on a stove; the sun is literally boiling itself away. “But,” says Adam Szabo of the NASA Goddard Space Flight Center, “solar wind does something that steam in your kitchen never does. As steam rises from a pot, it slows and cools. As solar wind leaves the sun, it accelerates, tripling in speed as it passes through the corona. Furthermore, something inside the solar wind continues to add heat even as it blows into the cold of space." 'Something unexpected' is happening on the Sun, Nasa has warned. This year was supposed to be the year of 'solar maximum,' the peak of the 11-year sunspot cycle. 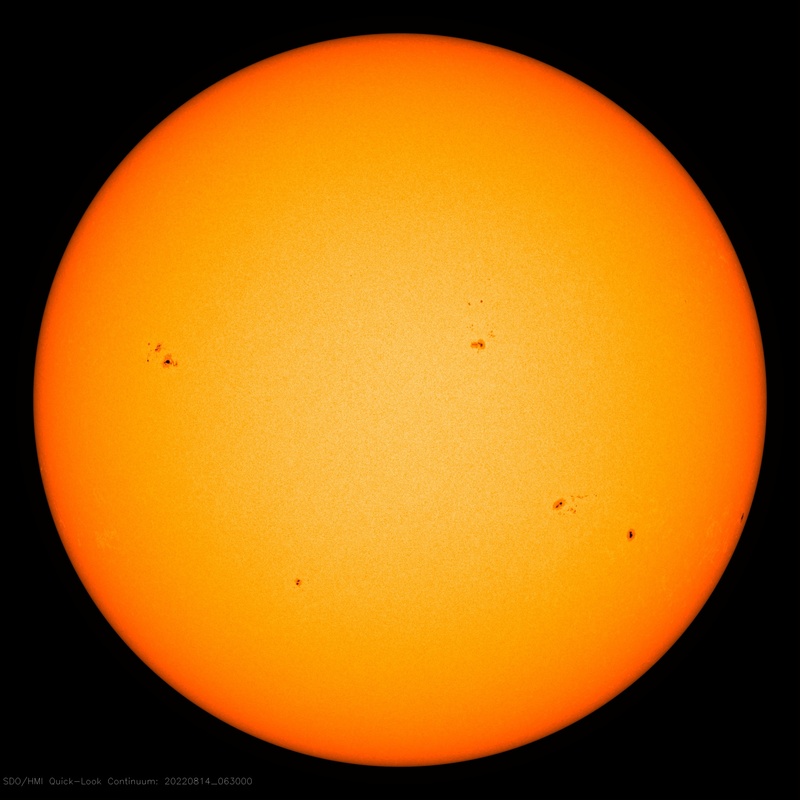 But as this image reveals, solar activity is relatively low. 'Sunspot numbers are well below their values from 2011, and strong solar flares have been infrequent,' the space agency says. Visit http://science.nasa.gov/] for breaking science news. Something unexpected is happening on the sun. 2013 is supposed to be the year of Solar Max, but solar activity is much lower than expected. At least one leading forecaster expects the sun to rebound with a double-peaked maximum later this year. Swept away by global warming climate change hysteria, governments are not ready for crop failures and shorter growing seasons of global cooling, foreshadowed by low solar activity. Though NASA is currently reporting a massive sunspot, solar cycle 24, our current phase, has been half as active as previous cycles suggesting another imminent Little Ice Age that could devastate food production for decades. Last week NASA released images of a massive, growing sunspot that is six times the size of earth. The Smithsonian Magazine reported on possible damaging impacts of a solar storm if directed at our planet. However, Friends of Science say this may foreshadow a problem North America is unprepared for – global cooling. Many solar researchers are convinced that the sun is entering into a long term period of very low activity. 07 February 2013 - The Met Office welcomes the Royal Academy of Engineering report on Space Weather, the UK's first in-depth study of the impacts of space weather. The report concludes that whilst the space weather risk can be engineered out of many systems, there is a still a need for real-time alerting and forecasting of space weather to help minimise the risks it poses. The UK Government has already made an investment in the development of a space weather prediction capability within the Met Office's existing scientific and forecasting capabilities. Mark Gibbs, Met Office Space Weather Business Manager, said: "Space weather is a relatively immature science but understanding is growing rapidly and here at the Met Office we are working with National Oceanic and Atmospheric Administration (NOAA) Space Weather Prediction Centre in the US. This collaboration aims to enable both organisations to accelerate the development of improved space weather models and prediction systems to make more effective use of space weather data." Through this work the Met Office is currently developing a real-time space weather warning service on behalf of the UK. 2013, the year of the Solar Maxima! For the 8th day in a row, solar activity is very low. None of the sunspots on the Earthside of the sun is actively flaring. NOAA forecasters put the odds of an M-class solar flare today at no more than 5%.